On Friday, 25th January 2019 at a whole-school assembly, Olive Ruane from Pieta House in Waterford came to present us with our Amber Flag based on all of our efforts to promote mental wellbeing during the 2017- 2018 academic year. 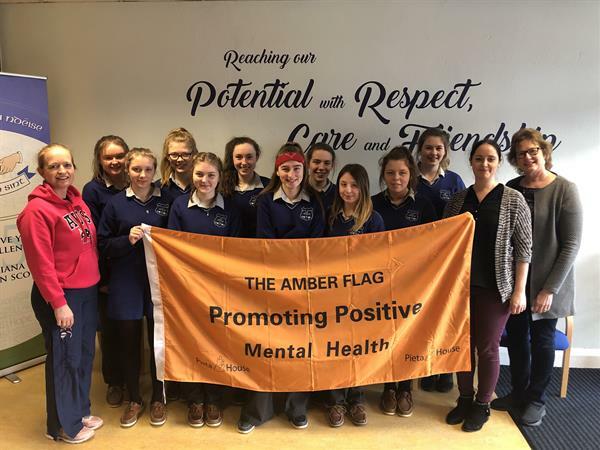 The Pieta House Amber Flag initiative recognises the individual efforts of primary and secondary schools, companies, and groups to create healthy, inclusive environments that support mental wellbeing. To be awarded the Pieta House Amber Flag, applicant groups must host a mental health awareness event, a fundraiser, and a mental health initiative. The programme encourages teamwork and student contributions and works with school guidance counsellors to include a peer-support element. The Amber Flag is in its fifth year, and over 450 flags have been awarded to date. We are very proud to have been awarded our Amber Flag. We would like to say a special thank you to our Guidance Counsellor, Ms. Gleeson who introduced the idea of the Amber Flag to our school and has been the anchor teacher throughout the application process. We look forward to continuing our focus on positive mental health and wellbeing in Ard Scoil na nDéise. January can be a hard month. The Christmas holidays are over. The days are still short and the nights are long. School is busy with coursework to be completed and, for some students, pre exams are on the horizon. Bad weather can keep us cooped up inside when we would love to be outdoors. Sometimes this time of year can take a toll on our wellbeing and our mental health. With that in mind, a dedicated group of staff and students got together to organise ‘Minding Me Week’ to help us all to beat those January blues. Ms. K. Gleeson and Ms. O’Shea worked very hard with our Transition Year committees to put together a programme of activities and guest speakers that would appeal to a wide variety of tastes and interests. A special word of thanks has to go to Ms. O’Shea for her super support of the Transition Year committees throughout the week. Some of the Minding Me Week committees have written reports on how they contributed to promoting positive mental health in Ard Scoil na nDéise. For Minding Me Week 2019, our group was in charge of organising a non uniform day in aid of Pieta House. We stuck up posters around the school with the slogan ‘On Tuesdays We Wear Pink’- each student brought in €2 and in total we raised €530 for Pieta House. We were very proud to present this money to Olive Ruane from Pieta House in Waterford who attended a whole-school assembly on Friday to speak to the school about the important work of Pieta House. Our group was also in charge of putting post-its on each students locker with positive message for each student to start off our week in a positive frame of mind. All of our group stayed in after school on Friday to stick up the positive quotes on every locker so it would be there for each student on the Monday morning. Everyone was delighted with the surprise! Our group was about sharing a happy song or quote with the school community through the intercom every day. Each morning we announced the activities that would be taking place that day to inform all the students and teachers. We decided it would be best to play a motivational, happy song every morning to help get the school off to a good start and to wake everybody up. Some of the songs included ‘Happy’, ‘Dancing in the Moonlight’ and ‘Sunflower’. The songs lifted the atmosphere in school every morning creating positive and happy vibes all around. In the afternoon we announced a quote of the day. All these quotes were based on the theme of mental health, happiness and positivity. Eating healthily has a huge impact on our wellbeing whether it is physical or mental. Our job as a group was to organise food related activities for minding me week. Having put our heads together and brainstormed ideas for the week, we decided to run a daily quiz, a recipe competition and a guest speaker to talk to us about eating healthily. Every day we put up a new quiz question in relation to food and being healthy in the foyers of the two buildings. Students could submit their answers and the correct answers would be put into a draw and the winner would be announced via the intercom and would receive their prize at break time. We decided it would be a good idea to organise a healthy recipe competition to encourage students to cook and eat healthily. We designed and hung posters around the school advertising this event. Students handed up their recipes and were judged. The winners were presented with prizes at the end of the week. Guest speaker Rob from Blásta Wholefoods came to the school on Thursday and talked to various year groups about the importance of healthy eating and how we can achieve it. He answered any queries we had about the topic at the end of the talk. Everyone walked away from the talk having learned something new. We even got a healthy alternative to Nutella! The Minding Me Week PE group was in charge of all physical activities throughout the week. Throughout the week, we took over as the teachers and we showed the classes a variety of games that they could play such as team building activities where they would all learn how to use their senses and work together. As PE classes are a double we had one class focused on Mental health so we laid out a yoga mat for each student and they followed a tutorial on YouTube about yoga for anxiety and meditation. Then for the second class we would play Just Dance so they would get some exercise in and help their mental health. This activity was also available to the students on Tuesday, 22nd at lunchtime where they got to bring a bit of fun to their lunch. As the topic of mental health becomes more and more prevalent in today’s society, an increasing amount of research surrounding the positive effects of dance on mental health has emerged. It was obvious that dance had a positive impact on all the students after they took part in Just Dance as everyone was in a really good mood. We had various guest speakers during the week. Liam Doocey ran workshops with all of our students. His workshops were entitled ‘It is all about you’ and focused on mental health, self-esteem, resilience, and developing good habits. On a similar note Stephen Dargan ran workshops entitled ‘Beat the Blues’ again focusing on strategies to promote positive mental health and resilience. We began by gathering fourteen outfits from ‘back in the day’ from various members of staff. Then we had a photo shoot of all the outfits in order to put photos of the outfits on display around the school. Next we needed to get a song from every teacher who brought in an outfit to make a playlist and a slideshow. On Friday we held a fashion show for the whole school where we announced which teacher owned which outfit and announced the winners of our competition. The fashion show was a great end to a really fun-filled week in the Ard Scoil.